Allegri and Cristiano during the training session. 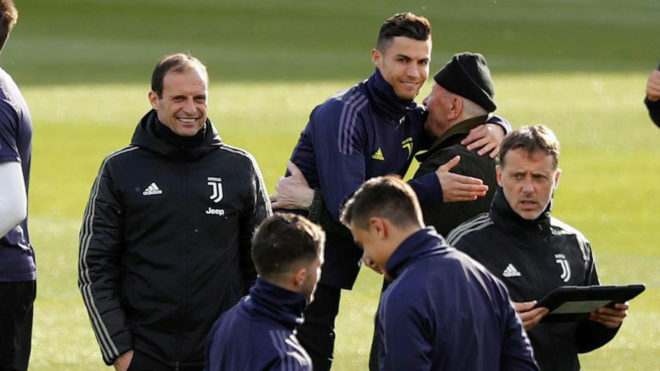 Juventus coach Massimiliano Allegri has labelled his team as fortunate for having Cristiano Ronaldo in their squad. The Portuguese forward has already scored four goals in the knockout stage of the Champions League, having hit a hat-trick to knock out Atletico Madrid in the last round, as well as finding the back of the net in the quarter-final first leg away at Ajax. “Cristiano has this extraordinary quality, which is that when the match arrives, he changes,” said Allegri. “You can see it in his face. He’s in better shape physically than he was last week. “I can say that it would have been weird if Juventus were knocked out from the Champions League with a single goal scored by Cristiano. “He then scored three against Atletico and one at Ajax. Allegri went on to confirm the absence of Mario Mandzukic and Giorgio Chiellini from the return leg of the quarter-finals against Ajax. “Mandzukic changes nothing [for Juve’s game plan], as there was already a good chance he could miss out. Now I just need to decide who plays instead,” the Italian noted. “Tomorrow night could have [Moise] Kean from the start, [Paulo] Dybala from the start or neither of them. If Kean or Dybala start, it’s normal that either [Mattia] De Sciglio or [Joao] Cancelo will be out. If neither of them start, then it’s possible both of them do. “I won’t make any decisions until tomorrow morning. You need to use only healthy players, as you can’t risk wasting a substitution. Mandzukic has a knee problem he felt since the AC Milan game, he tried training today and had to stop. “Douglas Costa stopped again with a calf issue after the first leg and is again not in the best condition, so at most he can play 15-30 minutes. He can be decisive in that period. “If you have Kean or Dybala, it’s a different type of match. You need to move the ball forward quickly and that’s something we didn’t do very well in Amsterdam. Ajax have impressed many in this year’s Champions League and Allegri is keen to not underestimate the Dutch side. “I see a match in which we measure ourselves with a different team than Atletico Madrid, and tomorrow the result of the first leg doesn’t count,” said Allegri. “It is a game in which we have to play with the same intensity with which we competed against Atletico. “We have to respect Ajax and be accurate in the passes and if we do, we will qualify to the next round, but it will be an infinite match.